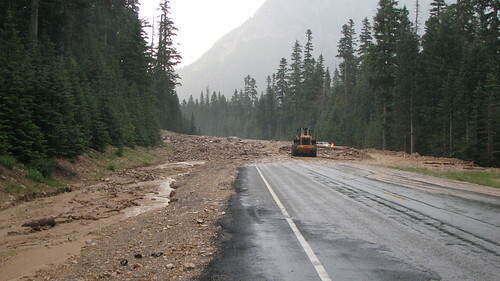 A landslide has come down across Highway 20 at about 4pm, July 29 (2009). The landslide follows days of high heat and thunderstorms. Here is the rain total for the last few days. I am switching the format around a bit to include Google Maps into the posts for a more interactive view. According to the WSDOT website: “They have about 300 yards of mud and debris in a 10-foot-deep swath across the highway to remove, and need to ensure the slope is stable before they will reopen the road.” That is a good sized debris flow. The debris flow appears to have come down somewhere near (or maybe in?) Swamp Creek, a tributary to Granite Creek. Here is some more information from the fine folks at WSDOT. The amount of material removed for the landslide was approximately 650 (or more) cubic yards of material. A dump truck carries, on average, 10 cubic yards, so we are looking at 65 dump truck loads of dirt. The work was completed by WSDOT road crews (sometimes this get contracted out for landslides) and the cost was probably a bit more than $3,000. That is dependent on a few factors, wages and equipment, but also dirt transportation and deposit (which becomes more costly the further out you have to go). On January 6th, 2009, a Pineapple Express (actually to have formed off of Hawai’i) flowed into Washington State, hitting the northern counties first and moving into the southern counties. Whatcom and Skagit Counties were first to report landslides late on January 6th as warm rains melted away snow and thawed the ground. As the rain continued, a small rain on snow type event occurred, spawning over 1,500 landslides. 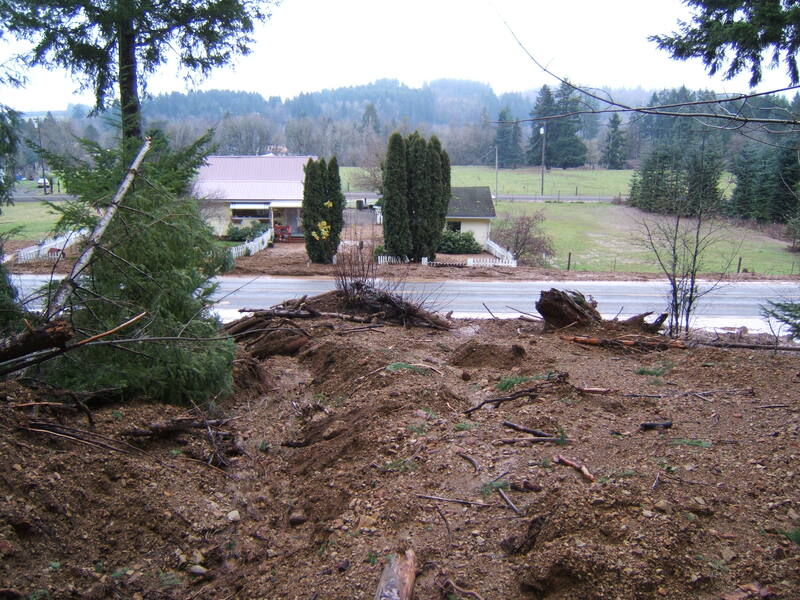 Debris flows and debris avalanches were the most common landslide to have formed from the storm event and the majority of the landslides occurred on the flanks of the Cascade Mountain Range. This map shows the storm intensity overlain with landslide initiation points, primarily from DNR/DGER aerial surveys after the storm and reported landslides from public and private folks. 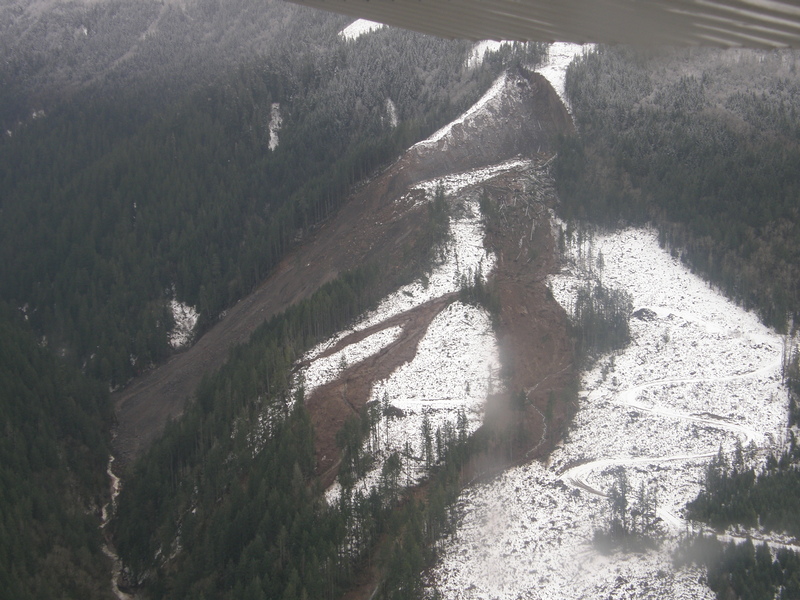 One of the largest landslides during the January 7-9th storm occurred along Racehorse Creek in Whatcom County. The landslide occurred in two major components, the main debris avalanche and near lateral debris flows. The main debris avalanche is over 160,000 square yards and moved a significant amount of trees into Racehorse Creek. The debris flows scoured into the ground, removing timber in its way, also reaching Racehorse Creek. Once in the swollen waters of Racehorse Creek, the moved debris moved downstream, forming a massive logjam. The size of the landslide has caused many to scratch their heads as to what possibly might have triggered this landslide. Some point to an earthquake as a possible trigger (one did occur on January 6th, 2009), others, natural factors of erosion and saturation. Or, as is common, a combination of saturated ground, erosion of the toe and a bit of shaking from an earthquake. 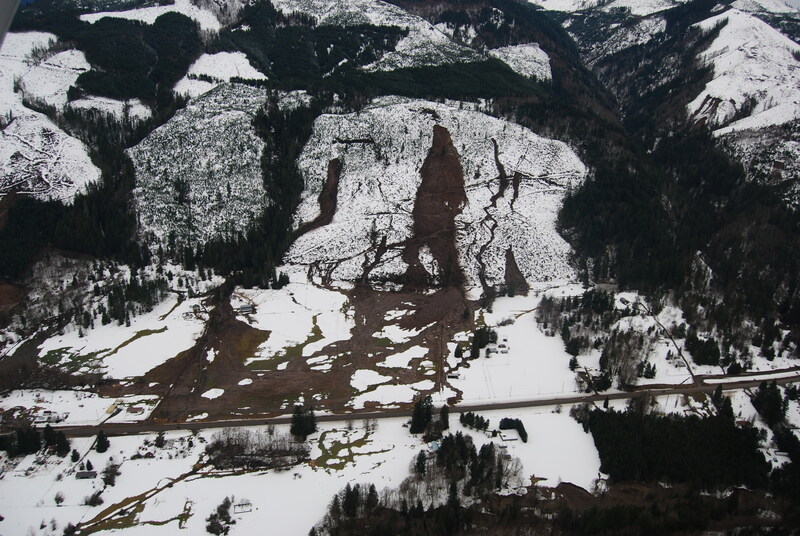 This is one of the more fascinating landslides that occurred during the January 2009 storm. 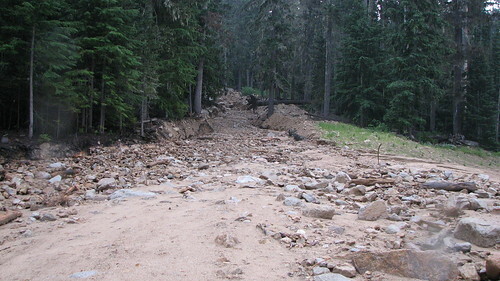 Numerous debris flows and avalanches dotted the slopes above Mark and Jon Hornby’s farm. At about 9:00 am on January 8, a large debris flow moved into Mark Hornby’s farm pasture, plugging a culvert and covering it with mud and debris. About a half an hour later, another landslide came off the slope, nearly striking Mark and his brother, Jon. I think this landslide also struck a bull and carried it a ways across the pasture. There full story can be found here. The debris avalanche/flow in the middle of the clear cut slope is very shallow, less than 2 feet of incision in many places. The landslide incised down to bedrock in most places, which was probably why the landslide was so shallow. 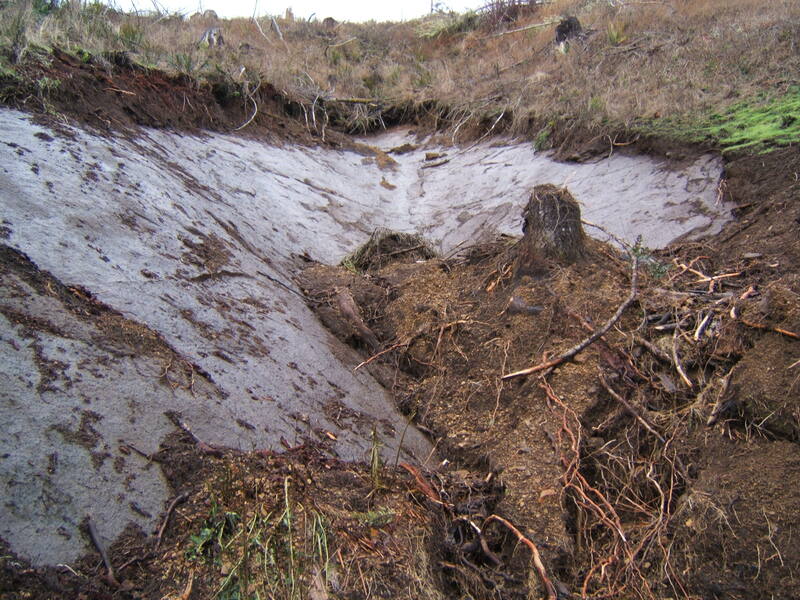 When it reached the pasture, the landslide turned into a short debris flow and then transformed into a hyperconcentrated flow and made its way across the Hornby’s Farm pasture. The landslide ponded against Highway 12, flowing to the Hornby’s driveway and then onto Highway 12. One of the oddities discovered in Glenoma was that many of the hyperconcentrated flows that reached the valley floor were entrapped into roads by snow berms from plowed snow. In December of 2008 and into January of 2009, cold air from British Columbia created an ideal condition for snowfall across Washington State. Snow accumulations preceding the storm were low in the Puget Lowland, with at only inches on the ground in most places. On January 7, a stream of moisture originating from around Kauai (Hawaiian Islands) flowed into Washington State, bringing warm temperatures and high amounts of rain, rapidly melting what snow remained in the lowlands and eating away at the snowpacks in the mountains. By January 8, the largest evacuation in the state’s history was under way, forcing more than 30,000 people living in the Puyallup River area to flee. The town of Orting, with a population of more than 26,000, was almost completely flooded. For the second year in a row, flood waters closed Interstate 5 in Centralia/Chehalis. In the rest of the state, rivers were also flooding—the Stillaguamish, Snohomish, Chehalis, Naselle, Hoko, Cedar, and Cowlitz were the most significant, peaking above the 100-year flood level. King and Snohomish County were least affected, as a rain shadow from the Olympic Mountains shielded their low-lying areas. In the Puget Lowland, rainfall totals ranged from 1.5 inches in Seattle to 5 to 7 inches in southwest Washington and 3 to 6 inches in the northwestern counties. As the storm progressed into the Cascades, the higher elevation forced the clouds to release water as they moved over the mountains, leaving more than 20 inches of rain in two days. The rainfall saturated slopes, many already wet from melting snow, triggering debris flows and debris avalanches throughout most of western Washington. 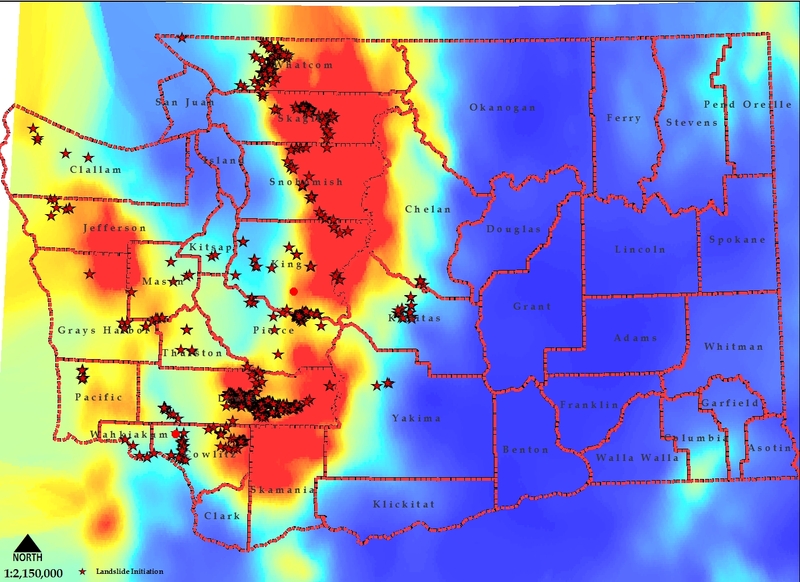 Areas sensitive to high-intensity storms, such as Glenoma, Concrete, and Van Zandt, were the site of numerous large debris flows, blocking roads, limiting emergency response, and destroying homes. 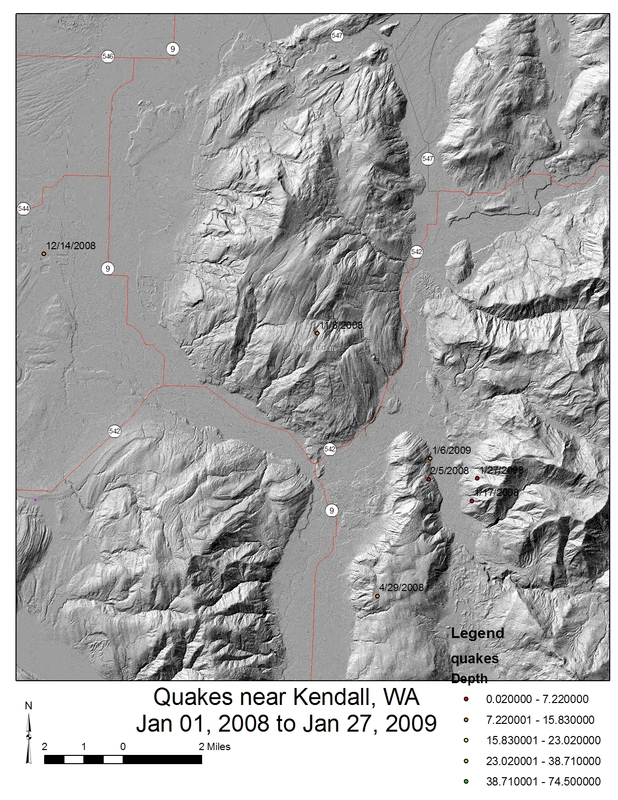 In the end, more than 1,500 landslides were reported or recorded from Washington Division of Geology and Earth Resources (DGER) field and aerial surveys. DGER and AEG hosted a field trip in the Glenoma Area (field trip guild). The purpose of this stop was to discuss logging and landslides. Unfortunately, the conversation never got going very well. It certainly caught my attention when I was looking over the photos coming in. One of the first things that caught my attention was the prominent deep-seated landslide on the west side of the clearcut. It is difficult to see if it is active from a photo, but when I first saw it from the aerial photo I thought it probably had some recent movement (within the last 100 years, maybe?). In the subsurface, there are places of thick, mostly unconsolidated pumice. So, is this logging related? It is possible. Was it illegal? Probably not. I didn’t do any detailed ground survey of this area, but just at a general glance, I cannot think of any forest practice rules that they might have broke. 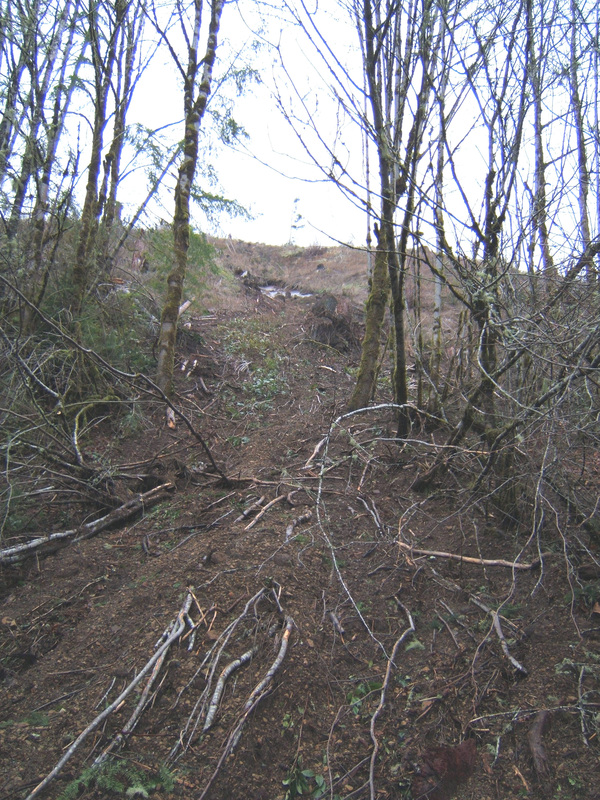 Maybe we need to look at if the FP rules are protecting our slopes, especially in Lewis County. Today is May 18th and it seems fitting that the Mt St Helens Debris Avalanche would be the landslide of the week. The Mt St. Helens Debris Avalanche is perhaps one of the most well known landslides in the world. “May 18, a Sunday, dawned bright and clear. At 7 a.m. Pacific Daylight Time (PDT), USGS volcanologist David A. Johnston, who had Saturday-night duty at an observation post about 6 miles north of the volcano, radioed in the results of some laser-beam measurements he had made moments earlier that morning. Even considering these measurements, the status of Mount St. Helens’ activity that day showed no change from the pattern of the preceding month. Volcano-monitoring data-seismic, rate of bulge movement, sulfur-dioxide gas emission, and ground temperature-revealed no unusual changes that could be taken as warning signals for the catastrophe that would strike about an hour and a half later. 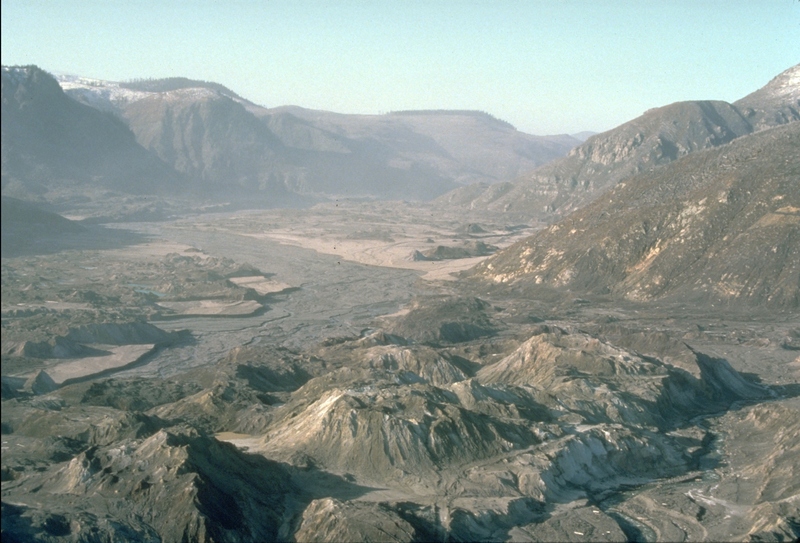 About 20 seconds after 8:32 a.m. PDT, apparently in response to a magnitude-5.1 earthquake about 1 mile beneath the volcano, the bulged, unstable north flank of Mount St. Helens suddenly began to collapse, triggering a rapid and tragic train of events that resulted in widespread devastation and the loss of 57 people, including volcanologist Johnston. Realizing their dangerous situation, the pilot put the plane into a steep dive to gain speed, and thus was able to outrun the rapidly mushrooming eruption cloud that threatened to engulf them. The Stoffels were fortunate to escape, and other scientists were fortunate to have their eyewitness account to help unscramble the sequence and timing of the quick succession of events that initiated the May 18 eruption. 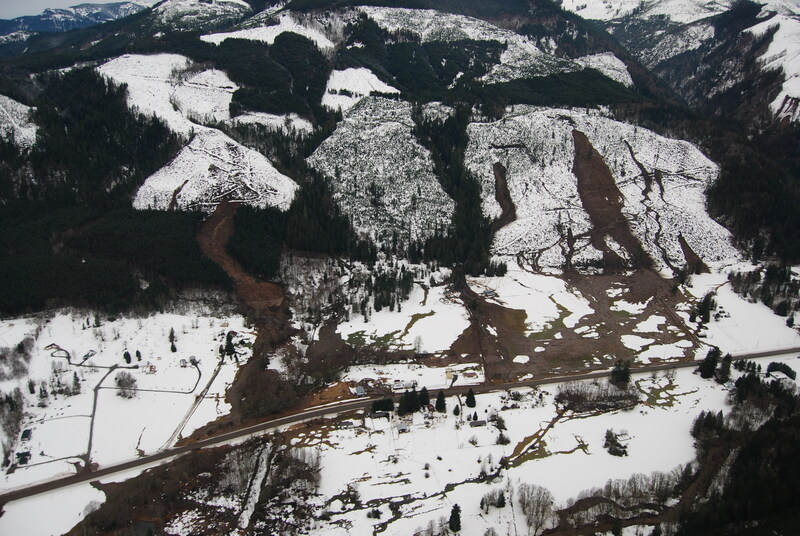 The collapse of the north flank produced the largest landslide-debris avalanche recorded in historic time. Detailed analysis of photographs and other data shows that an estimated 7-20 seconds (about 10 seconds seems most reasonable) elapsed between the triggering earthquake and the onset of the flank collapse. During the next 15 seconds, first one large block slid away, then another large block began to move, only to be followed by still another block. The series of slide blocks merged downslope into a gigantic debris avalanche, which moved northward at speeds of 110 to 155 miles an hour. 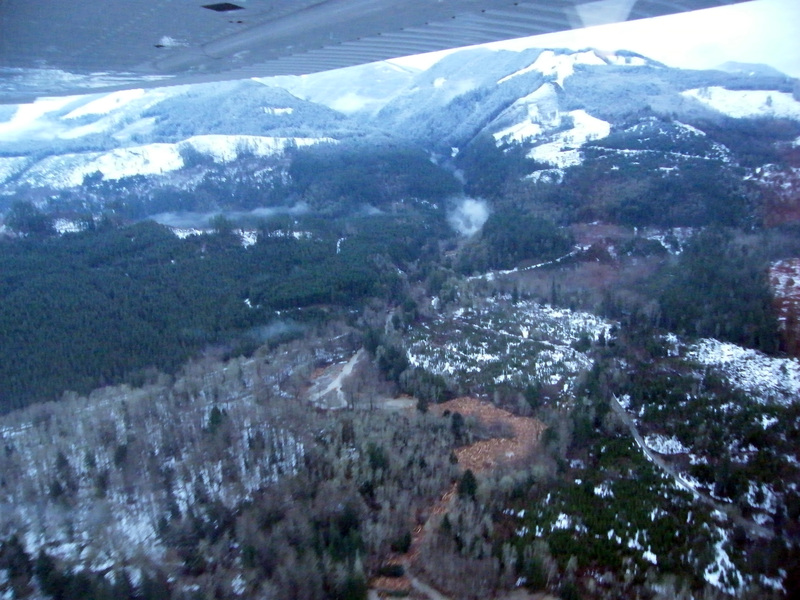 Part of the avalanche surged into and across Spirit Lake, but most of it flowed westward into the upper reaches of the North Fork of the Toutle River. At one location, about 4 miles north of the summit, the advancing front of the avalanche still had sufficient momentum to flow over a ridge more than 1,150 feet high. The resulting hummocky avalanche deposit consisted of intermixed volcanic debris, glacial ice, and, possibly, water displaced from Spirit Lake. 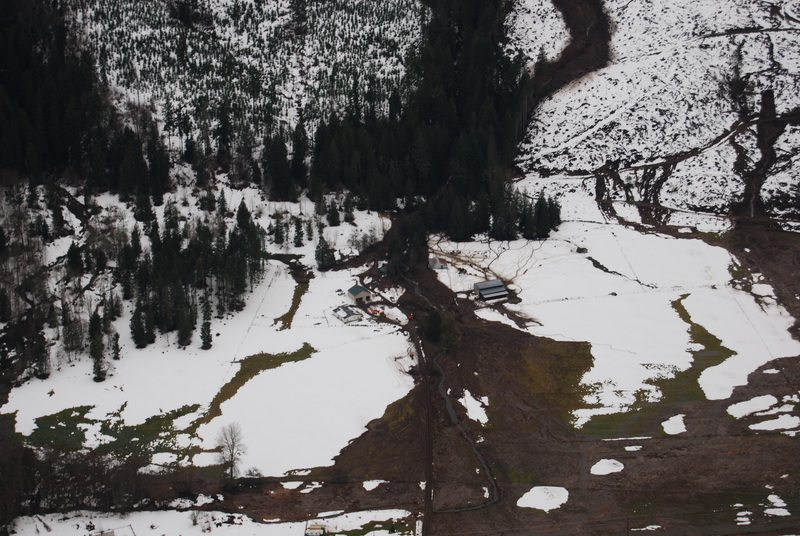 Covering an area of about 24 square miles, the debris avalanche advanced more than 13 miles down the North Fork of the Toutle River and filled the valley to an average depth of about 150 feet; the total volume of the deposit was about 0.7 cubic mile. The dumping of avalanche debris into Spirit Lake raised its bottom by about 295 feet and its water level by about 200 feet. Volcanic debris flows-mobile mixtures of volcanic debris and water popularly called mudflows -often accompany pyroclastic eruptions, if water is available to erode and transport the loose pyroclastic deposits on the steep slopes of stratovolcanoes. Destructive mudflows and debris flows began within minutes of the onset of the May 18 eruption, as the hot pyroclastic materials in the debris avalanche, lateral blast, and ash falls melted snow and glacial ice on the upper slopes of Mount St. Helens. Such flows are also called lahars, a term borrowed from Indonesia, where volcanic eruptions have produced many such deposits. Mudflows were observed as early as 8:50 a.m. PDT in the upper reaches of the South Fork of the Toutle River. 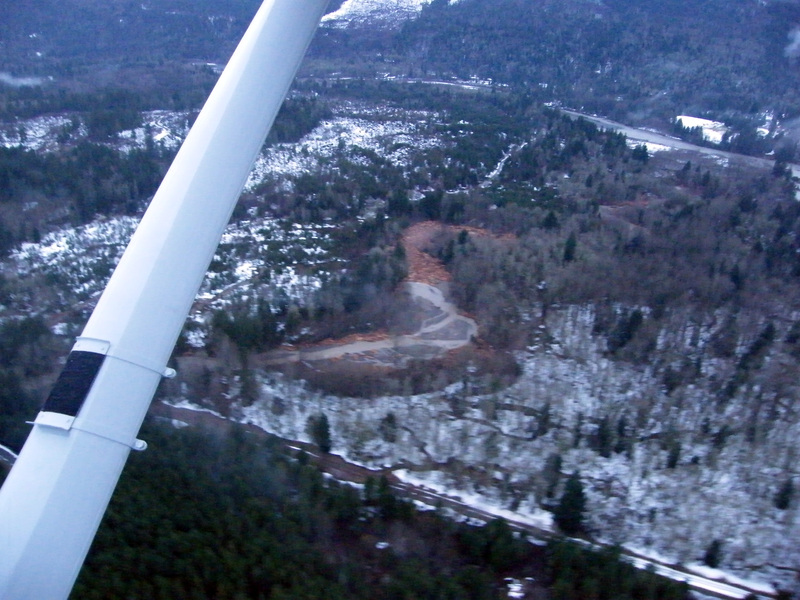 The largest and most destructive mudflows, however, were those that developed several hours later in the North Fork of the Toutle River, when the water-saturated parts of the massive debris avalanche deposits began to slump and flow. 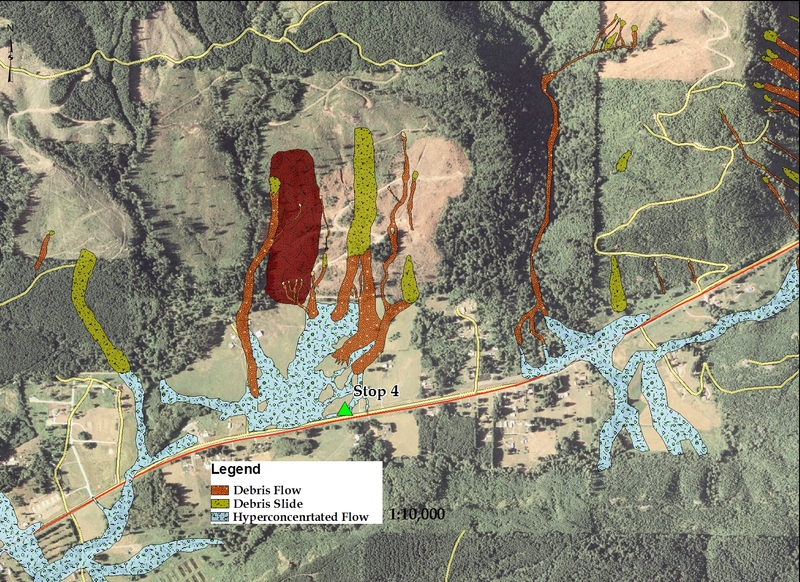 The mudflow in the Toutle River drainage area ultimately dumped more than 65 million cubic yards of sediment along the lower Cowlitz and Columbia Rivers. The water-carrying capacity of the Cowlitz River was reduced by 85 percent, and the depth of the Columbia River navigational channel was decreased from 39 feet to less than 13 feet, disrupting river traffic and choking off ocean shipping. 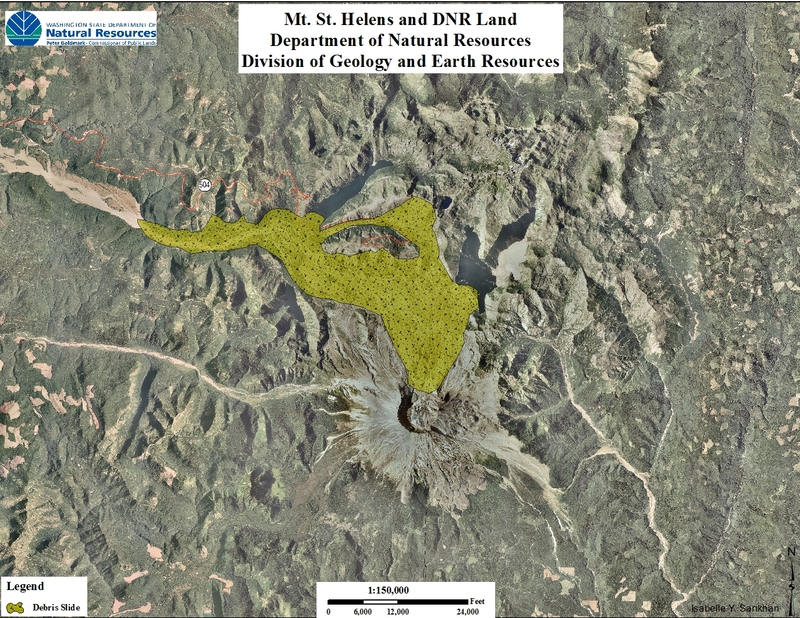 Mudflows also swept down the southeast flank of the volcano-along the Swift Creek, Pine Creek, and Muddy River drainages and emptied nearly 18 million cubic yards of water, mud, and debris into the Swift Reservoir. The water level of the reservoir had been purposely kept low as a precaution to minimize the possibility that the reservoir could be overtopped by the additional water-mud-debris load to cause flooding of the valley downstream. Fortunately, the volume of the additional load was insufficient to cause overtopping even if the reservoir had been full.